When the depth of sheet piling support or external load (such as heavy docks crane) is too large, the earth pressure can be reduced by the load-relief platform. The load-carrying platform can withstand the load and the weight of the upper support soil and transfer these loads to the deep soil layer, thus not affecting the pressure on the cold-formed sheet piling wall. 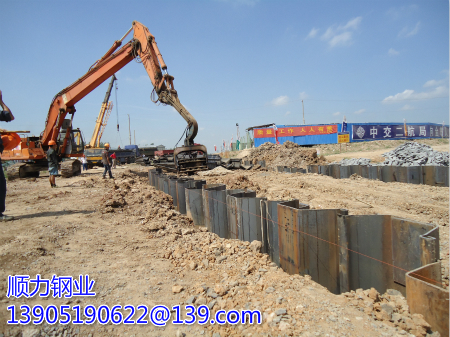 Load-bearing piles can either support the Load-bearing platform, can also be transmitted to the deeper soil layer also n to anchor the wall. Part load of the load-shedding platform can be supported by the main pile of the pile-plate wall. If the vertical load is too large, the box-type pile or pile with high-section modulus can be used. In addition, can Also be directly bearing pile cloth cloth plate wall in the post. The load-carrying platform must penetrate the surface of the earth above the platform and behind the wall to prevent the earth pressure wall from occurring on or behind the soil. The concrete retaining wall needs to be designed to ensure its stability can be extended to the Ground, At the top of sheet piling wall at the top of the pile wall to prevent the earth or on the soil to produce the earth pressure wall, concrete retaining wall needs additional design to ensure its stability Can be extended to the ground, or cut Off at the platform at the top of its set above the concrete block.